Long Beach, CA January 4th, 2013 18:00 PST - Rouchon Industries Inc., dba Swiftech® is proud to announce the imminent release of the H220 CPU cooling kit, a new all-in-one liquid cooling system compatible with all current Intel® and AMD® desktop processors that will ship to consumers already pre-filled for plug-and-play operations. Setting itself apart from similar offerings, the product will also feature full expansion capabilities to include additional cooling devices for graphics and or chipset. The H220 will be unveiled during the Consumer Electronics Show held from January 8th to 11th in Las Vegas, NV and Swiftech® will demonstrate several systems featuring the new cooler capabilities at the Mandalay Bay Hotel Penthouse suites. In a related announcement, the company disclosed that they had successfully developed and begun high-volume manufacturing of a new generation of Swiftech-made mini-pumps, specifically designed for the liquid cooling market. The pump combines a compact design, high-reliability (60,000 hours MTBF) and the high head-pressure performance characteristics necessary to drive multiple devices in the same cooling loop. Being PWM controlled, the device can be driven by any motherboard like a regular CPU fan. 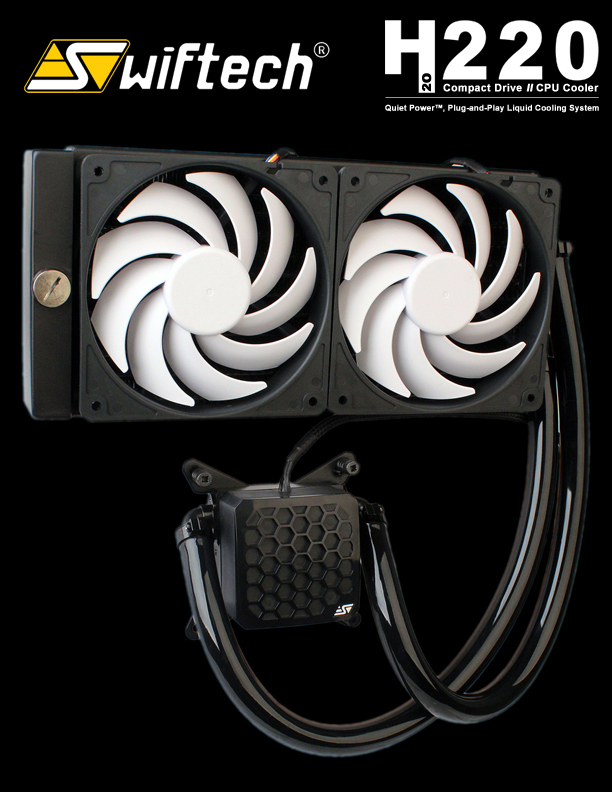 Thanks to this new pump and to substantial economies of scale, the company claims that their new H220 CPU cooler will offer thermal performance with a low to inaudible acoustic signature rivaling that of the best custom kits, all at the price of an entry level product. In the words of Gabe Rouchon, the company's Chairman and CTA, "This thing is ridiculously quiet; if the chassis light wasn't on, I couldn't even tell the system was running". Mr Rouchon also stated: "User convenience and the vast movement of novice builders towards liquid cooling was a critical consideration in the H220 design. It dictated that the kit would be pre-filled and completely plug-and-play. As a result, tuning and operations are as simple as using a regular CPU cooler. But with a 15 year heritage serving the enthusiast community, we also wanted to eliminate some of the limitations of the existing low-cost systems which are unable to accommodate add-on components because (a) they are sealed-up and offer no means to refill the system without voiding the warranty, and (b) the type of pump they use is not adequate to drive sufficient flow to cool more than a CPU. The Swiftech® H220 kit addresses both issues by featuring a reservoir with fill-port built into the radiator so that the system can be easily emptied or refilled by the user at will, and by our new high-pressure pump. It all seems that 15 years of innovation and know-how, together with some of the most extensive R&D we ever conducted have led us to this moment, and we are truly proud to present a solution that finally bridges the gap between full custom and sealed-up liquid cooling kits".